Season chicken with salt and pepper. Place in shallow baking pan. Mix well remaining ingredients; pour over chicken. 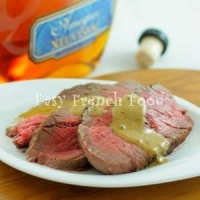 Roast in preheated 350° oven, basting every 15 to 20 minutes, for 45 to 60 minutes or until golden brown and fork-tender. Makes 4 servings. Recipe categories: Chicken, Main dish, Whole chicken.